Preparation - Ramblings of Mad Shutterbug & the Border Collie Bros.
Today's entry is preparation work for next month's Camera Club competition. I'm embarking on another experiment here, to provide you folks with time to kick me some on whether the image works or not. Camera Club allows me to enter a total of six photos into the critique/competition: 2 in Colour, 2 in Monochrome, and 2 in Creative (Non-photo-realistic). The theme for next month is 'Mirror', looking to get both the reflecting surface and the subject reflected into the photograph. Nice overall image, very good use of texture and light. Pretty broad midtonal range, though. Can you compensate for levels, or is that verboten for this competition? Not verboten, and I will most likely take a look at that. Thanks. Ditto. I would either adjust the overall contrast or do some localized dodging and burning to really lead the eye around where you want it to go; right now I *see* the pond and the ball, but then I go back to the really dark place under those big spikey grasses and stay there. If you are really going to do some post-processing, and want the gazing ball to be the focus, I'd work with lens blur to create a version of this image with much less d-o-f.
Alternately, I'd crop the left half out. Which direction to adjust contrast? This one is already bumped a bit to the plus side. Increase, yes, but possibly by compressing the midtones and expanding the shadows and highlights. What technique are you using to increase your contrast? Contrast & Brightness, increase contrast (+11 IIRC), no change on brightness. I take it you want some critique, then? One thing that I've noticed you do quite frequently is to try and stuff too much into one frame, and you're doing just that here. You've got two reflecting surfaces (tick box for theme relevance) and quite a lot of busy (too busy perhaps, but it could possibly be persuaded to work) textures for them to be relecting. The number one problem I see here is that the ball and the pond are not relating to each other at all. Without the ball the pond is just a pond. Pretty, reflective, but ultimately pretty meh. 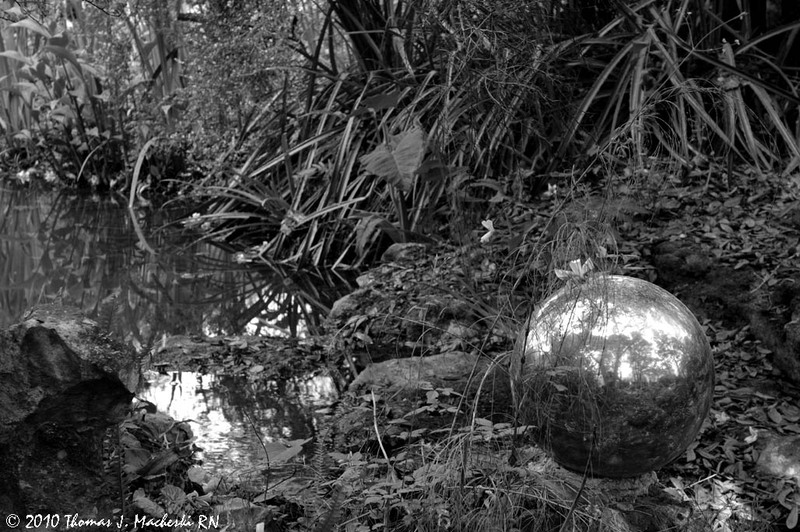 The ball is by far the more interesting reflector, being that it is so totally out of place in the bush, but it's hanging in mid air and not clearly relecting what it is hanging off. I want to see it touching and being touched by it's surroundings. Ideally I'd want to see it reflecting the pond the pond and vice versa. If it were mine, I'd also try to make a whole lot of the background clutter -go away- either by choice of angle or a really shallow DOF. What they said about the ball and pond. That was my gut reaction - the ball needs to be on the pond so they can reflect off each other. Interesting you see the ball as hanging in mid-air. It is quite solidly set into rock/concrete. It looks like a christmas ornament hung off that ferny thing in the extreme foreground - I see now that it's a) larger and b) further away than I originaly thought. Ah, but that tells me a great deal about the perspective in this. Might not be so right for the critique/competition, then. Yeesss. I think you've got a set of good ideas here that haven't quite worked together. I know that happens to me rather more often than I would like. uh, hmmmm, I can't even try to add a comments like the others but I do like the photo. I see that everyone said the same thing here that I did on DW! I feel better now, knowing it was not just me. Posted the colour version today.